Prime Finance has written an $83 million floating-rate loan to finance the acquisition and stabilization of a Las Vegas office portfolio. 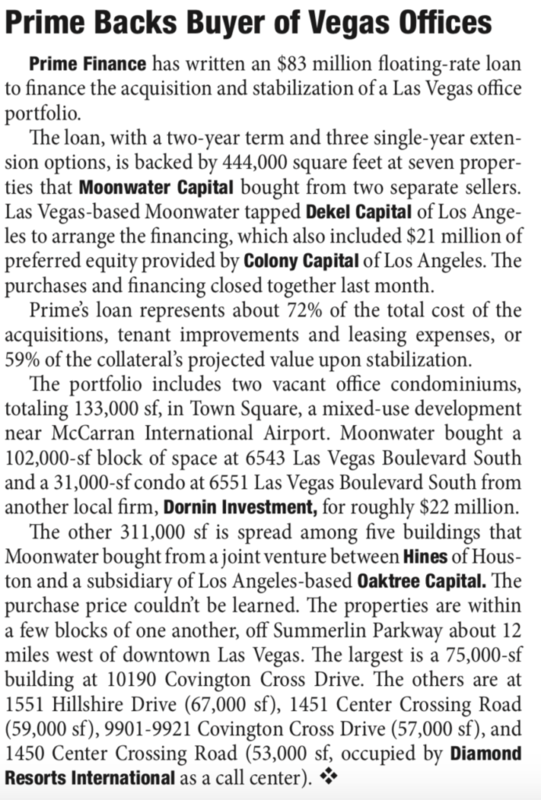 The loan, with a two-year term and three single-year exten- sion options, is backed by 444,000 square feet at seven proper- ties that Moonwater Capital bought from two separate sellers. Las Vegas-based Moonwater tapped Dekel Capital of Los Angeles to arrange the financing, which also included $21 million of preferred equity provided by Colony Capital of Los Angeles.